Pre-made hand cast willow pineapple replacement feet. Green pineapple is original willow pineapple foot. 3 clear ones are replacement castings. White one is a casting painted as an example. These are waterproof and make prefect replacements as they won't break like traditional willow pineapple feet. Willow replacement pineapple feet slip right over the leg of the chaise/chair/table/couch/loveseat/etc. These are lightweight and paintable. Material can be colored with stain to color match material in our shop, otherwise these can be painted. Again, green is original willow foot, clear is the casting, white is an example of a painted casting (white one is actually the experimental casting, with the clear being the final worked all the bugs out product). 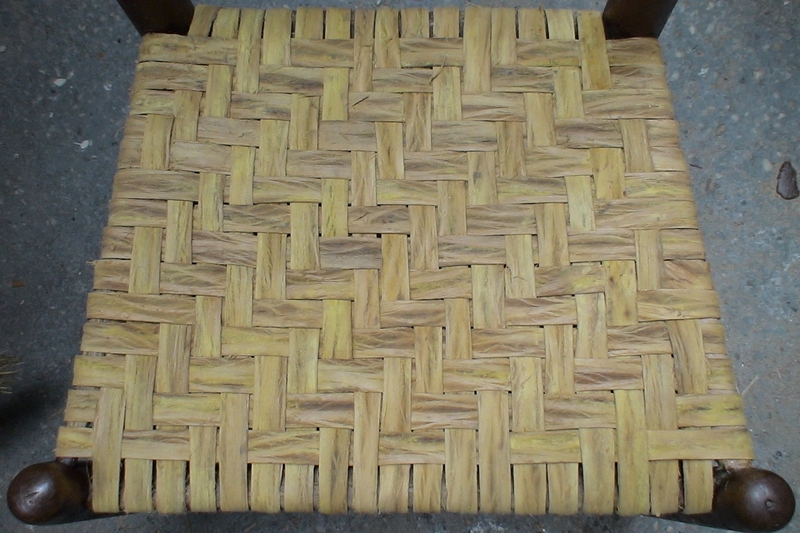 Hickory Splint seat - (after) ash seat was replaced with hickory as hickory is much tougher and will last longer, this seat is natural without a finish.